In the first round, every entrant plays four games, scoring points based on finishing position (1st=5 points, 2nd=4, 3rd=3, 4th=2, 5th=1). The ten players with the highest total points advance to the semi-final. Each semi-finalist plays two games, with the four winners and the runner-up advancing to a single winner-take-all final. Among the twelve full boards in the first set of games were five former champions and eight of last year's ten semi-finalists. At one board, Carolyn DeMarco edged out three-time former champion Ray Pfeifer for the closest 1-2 finish in the tournament when both finished at +7 spaces but Carolyn had an eleven-card set to Ray's nine-card set. This game also ended with all five players crossing the finish line. At another board, William Burch won his game ending with a thirteen-card set at +7 spaces, while Jeff August had the best finish at +9 spaces at a third board. There were eleven full boards in the second set of games. Three of the twelve winners in the first set of games repeated that feat, with Erika Poniske having the best tiebreaker at fifteen spaces, followed by Thomas Browne at eleven spaces and 1993 champ Tom DeMarco at nine spaces. Steve Cameron won his first of three games in a row as the green player with a +10 space finish. Sarah Bockmiller won in a game with the tightest bunching of the players at the finish (at +4, +2, +1, -1, and -2 spaces from the finish line). 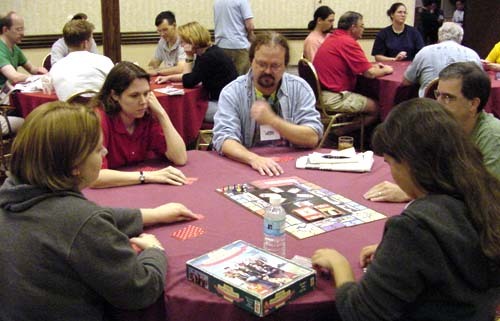 The third set of games consisted of nine boards, three of which were four-player games. Derek Landel, Patrick Mitchell, and Nicholas Henning all won their games ending without a set, while Ivan Lawson, Bruce Bernard, and Sarah had the best finishes at their boards at +7 spaces. The overall leaders at this point were Sarah with two wins and a second (14 points), then Steve, Nicholas, and Thomas with two wins and a third each, and Patrick with one win and two seconds (13 points). Finishing off the first round was a group of seven boards, with one four-player game. Frank Cunliffe won his game fourteen spaces ahead of second place for the largest lead at the finish. Steve won his third in a row (as the green player) at +12 spaces past the finish. Ed Fahrmeier won his game which ended with pieces on the same five spaces as Sarah's tightest bunching finish in the second set of games. Sarah was in this game too, but finished fifth this time. Totaling the score for all four games, Thomas and Steve had the most with three wins and a third for 18 points, followed by Frank and Nicholas with 17 points, Mike Bergt and 1998 champ Mark Geary with 16 points, and Derek, Sarah and Patrick with 15 points. Five players finished with 14 points. Carolyn had to use the second tiebreaker (total of cards in the finishing sets) to beat out her dad (and fellow Family Affair team member) Tom from his Team Tournament game and grab the last semi-final spot. Also at 14 points were Ed, Bill Beckman, and two-time and defending champ John Pack. After moving from the Maryland ballroom down to the Valley ballroom to escape the start of the boisterous Slapshot tournament, the ten semi-finalists were split for the first two of four semi-final games. At one of the first two boards Steve beat Sarah, Frank, Derek and Nicholas to win his fourth game in a row, finishing at +9 spaces. Nicholas used the four space bonus for having the second best set to move up from fourth to second place at +1 space. At the other board, Patrick's thirteen-card set gave him the eight-space bonus for the largest set at game end and catapulted him from fifth place to win at +5 spaces, finishing ahead of Mark who finished second at +3 spaces, followed by Thomas, Mike, and Carolyn. Thomas won one of the last two semi-final games, finishing at +9 spaces, with Frank coming in second at +3 spaces and Derek and Carolyn trailing. The final winner was Nicholas, who advanced to the farthest possible position at +13 spaces, way ahead of Mike, Mark, and Sarah. The best runner-up and last finalist was Mark, whose +3 spaces and seven card set just edged Frank's +3 spaces and six-card set. Frank took sixth place in the tournament for the second year in a row. So after playing for over four and a half hours, the five finalists then settled down for the seventh and final game. Nicholas tried for a quick run for the finish instead of trying to collect a larger set. He was nearly successful, crossing the finish line first to trigger the end of the game. But Thomas was able to stay close enough so that when he gained the eight space bonus for having the best set, he moved four spaces past Nicholas to finish at +5 spaces. Mark had the second best set, but the four space bonus wasn't enough to pass Nicholas, so he took third place, with Patrick and Steve finishing fourth and fifth. One of twelve tables in the opening round. This year the blue player won the most games, taking twelve victories, with the red and green players getting the fewest wins with seven each. The red player also ended up in last place the most (fourteen times), with the yellow and green players having the fewest last places at six each. The yellow player averaged 3.32 points toward advancing to the semi-final, down through blue, black, and green to red who averaged 2.64 points. The yellow player also had the highest average ending spot at 0.16 spaces short of the finish line, down through blue, green, and black to red at 3.44 spaces short of the finish. Looking over the results for the last four years, the player of the black cards has won over one quarter of the games at 26.8%, down through blue, red, and green to the player of the yellow cards, who has won less than one sixth of the games at 15.2%.